Today the news is reporting how the GDP dropped is the 'biggest in 27 years'. The media likes to write headlines with "worst in X years" or "most in X years". We've seen a few of those lately in the bad economic news category. Today's announcement was a 3.8% drop in real GDP. Real GDP is the GDP with inflation considered. The news release from the Bureau of Economic Analysis covers the details. The chart is showing the percent change in GDP per quarter from 1947 to 2008. The most recent year end quarter 2008 change of -3.8% is circled in yellow. You can see that it hasn't had a drop like that in a couple decades. 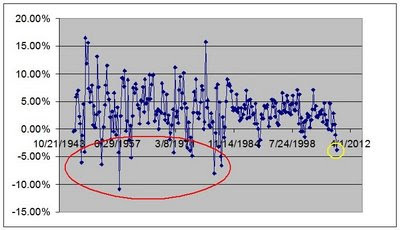 But if you look back further we see the period circled in red where there were several more drastic drops. GDP has had worse drops 12 different times in the past 60 years. First quarter of 1980 = -8.07%. In the end of 1981 there was a recession with GDP contraction worse than what we've had in the past 2 quarters. The drops then were Q4 1981 = -6.56%, Q3 1981 = -4.98%. Compare that to the recent declines of Q3 2008 = -1% and Q4 2008 = -3.8%. One interesting note in the BEA news release is this: "Motor vehicle output subtracted 2.04 percentage points from the fourth-quarter change in real GDP..." So a very large portion of the GDP decline is due to decrease automotive sales. If you didn't think that the auto industry had a significant impact on the US economy then this should show you otherwise. The -3.8% drop we saw in GDP is certainly not good news. However the decrease in the economy is not as bad as we've had in some previous decades. Its good to keep things in perspective.